Even when their titles seemingly have no direction, the X-Men can (and often do) fall back on good, old-fashioned resurrection stories to revive one of their beloved characters. Logan’s back, Jean’s coming back, and now, it’s Professor Xavier’s turn. While the rest of Marvel’s comics universe has been busy setting up its next batch of crossovers leading up to a major cosmic event, Charles Soule’s Astonishing X-Men has kept its heroes busy with a mysterious threat emanating from the astral plane. When Psylocke discovers that the Shadow King is attempting to turn the world’s telepaths into a psychic botnet that’ll allow him to cross over into the physical plane, she sends Rogue, Old Man Logan, Fantomex, Bishop, and Gambit into the astral plane to destroy him there. Unbeknownst to the X-Men, the Shadow King had taken a psychic echo of Xavier as his prisoner—an echo left long after Xavier’s physical body was murdered by Cyclops during Avengers vs. X-Men. As the X-Men have been traversing through the astral plane to shut the Shadow King down, he and Xavier have been locked in a psychic battle of their own that’s dragged on for what feels like thousands of years. All the while, the Shadow King’s power has been growing ever stronger, thanks to a psychic virus he unleashed in London that turns ordinary people into mindless zombies under his control. Between his battles with Xavier, fighting the X-Men on the astral plane, and maintaining his grip on the infected, Shadow King all but insured his triumphant return. But in this week’s issue of Astonishing X-Men, Xavier revealed he’d been playing an elaborately long con on his foe. 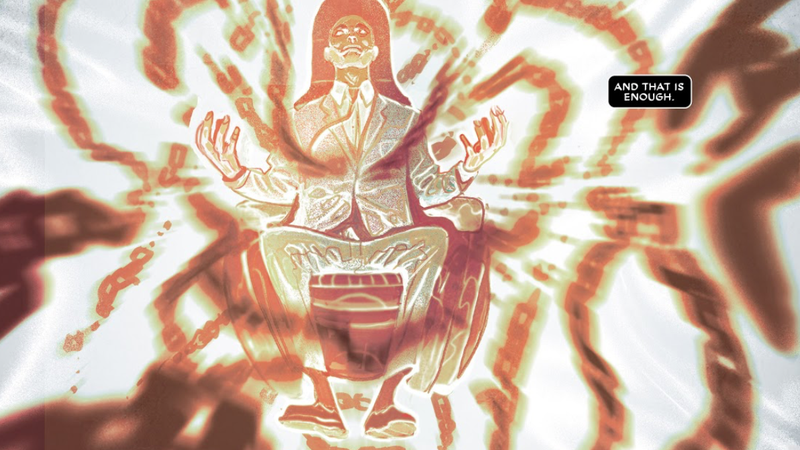 Rather than continuing to fight for his freedom within the astral plane, Xavier resigned himself to their chess-like battles and allowed the Shadow King to stretch himself thin between fighting the X-Men and reaching into the physical world. With the Shadow King so distracted, Xavier reasoned that eventually, he’d be able to burst from the psychic chains binding him, which he does before promptly killing the monster. With the Shadow King defeated and the psychic plague beginning to wear off, Psylocke starts to pull the X-Men back from the astral plane one by one, but one of them is able to wake up on his own—something that only a powerful psychic can do. In the final page of the issue, Fantomex pulls the mask from his face and explains that he isn’t really Fantomex anymore, he’s actually Professor X inhabiting Fantomex’s body. The real Fantomex, we see, willingly gave up his body so that Xavier could go back. It isn’t explained exactly why the Professor didn’t just, like, hitch a ride in Fantomex’s mind and simply share his body, but that’s the X-Men for you. As X-Men resurrections go, Professor X’s is certainly one of the more... convoluted, but judging by the shape of things to come in Marvel’s comics the world is probably going to need its most powerful telepath back in action.